Jun. 21, 2016 7:00 p.m. In 1866 the 17-year-old British colony of Vancouver Island officially ceased to exist thanks to a forced merger with the mainland colony of British Columbia. In 1878, seven years after joining confederation, B.C. voted to leave Canada in frustration over failed federal promises tied to the Island. The threat proved empty and the promises remain partially unfulfilled, but a century and a half later, a small group of Vancouver Islanders led by a Harvard-trained economist aims to right that wrong, and, in the process, make the Island Canada’s 11th province. The Vancouver Island Party officially launches tomorrow with the goal of protecting and enhancing the Island’s economic, environmental, social and cultural identity by leaving B.C. and applying to join confederation as an independent entity. Led by Robin Richardson, a former MP in Joe Clark’s Conservative government, the VIP intends to field candidates in all 14 Island ridings in the 2017 provincial election and push to get the region full provincial status by 2021. According to the VIP leader, the primary issues facing Islanders are climate change, federal and provincial government indifference, and economic, environmental and social injustice. The solution, he said, is self-determination. At the moment, the party has no connection to the deliberately non-partisan VIprovince initiative launched a few years ago by the Vancouver Island and Coastal Conservation Society. VIprovince spokesperson Laurie Gourlay was unfamiliar with the VIP prior to being contacted by Black Press, but obviously intrigued with its mandate and the fact it hopes to build on the federal and provincial petitions he launched in 2013 requesting provincehood. Perhaps reflecting the Island itself, the VIP platform is an interesting mishmash of ideas pulled from different ends of the political spectrum. 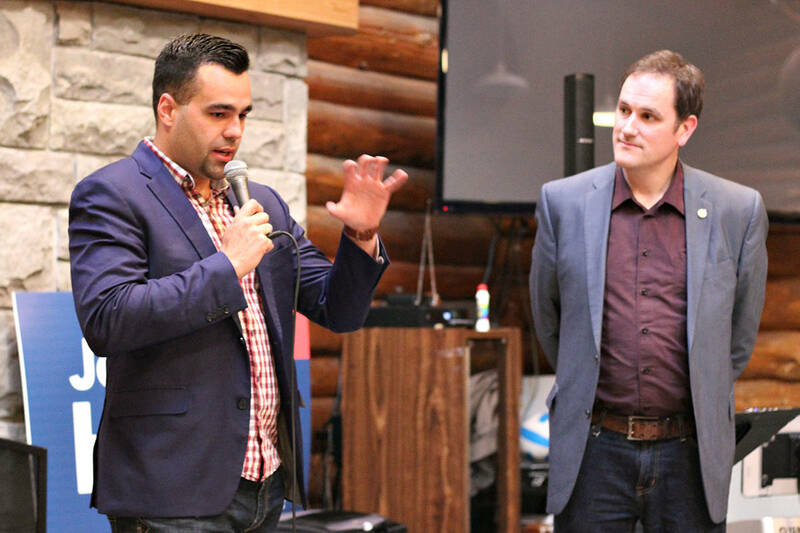 “The Vancouver Island Party is centrist in nature,” Richardson said. “We are fiscally responsible, socially progressive and environmentally green. We welcome all VanIslers, irrespective of their former political affiliation. Given that the platform was drafted largely by a former economist for the Canadian Taxpayers Federation who also happens to be a Christian minister, it should be no surprise that balanced budgets, fiscal conservatism and family values play prominent roles. A flat tax is on the table. Tax relief for the middle class and competitive business taxes are promised. But the vision statement also carries a broad green streak with a commitment to sustainability and social justice. Preferential hiring policies for Vancouver Island residents, buy and grow local incentives, increased investment in public transportation, renewable energy programs, guaranteed annual incomes, a shift from resource extraction to value-added manufacturing, marine and groundwater protection, and cheap or free post-secondary education directives are also in place. Democratic reform also factors into the plan, including proportional representation, recall laws and a shifting of power from the capital to local and regional governments. Some of the touchier local issues like marine oil tankers and old growth logging could be addressed through planned direct citizens initiatives. Right now, the party is small, basically consisting of Richardson and a handful a like-minded Islanders, none of whom has a prominent public profile. Their goal is to change that with a recruiting drive over the next few months. Members intend to actively approach local government. community and First Nations leaders and have a team in place by November. Ideally, voters give the party a presence in the next legislature, which could convince the next government to put the issue on the ballot for 2021. He plans to reach out to the VIprovince group in the near future to share ideas, piggyback on the existing petition initiative and see how they can work together. Gourlay’s initiative had some small successes recently with a decision by the B.C. government to temporarily fly the Vancouver Island flag at the legislature a few weeks ago, and a letter earlier this year from Prime Minister Justin Trudeau acknowledging the Island’s heritage as a separate colony. He said the reaction from Islanders has been mixed to separation: about one-third in favour, one-third opposed and one-third indifferent. Without making any political endorsement of the VIP, he welcomes the fact that it will get people talking.